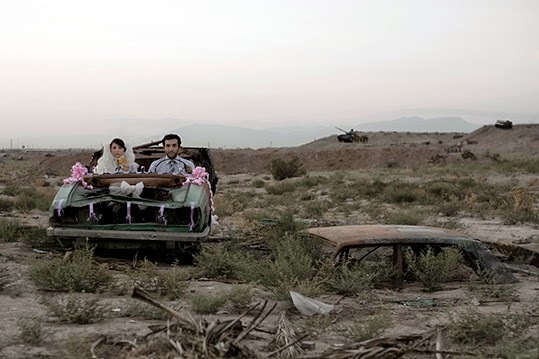 Untitled #5 is one of several staged photographs from the Today's Life and War (2008) series by Tehran-based artist Gohar Dashti (b. Ahvaz, Iran, 1980). A man and a woman enact domestic activities in a fictionalised battlefield whereby symbols of war interrupt the everyday. In Untitled #5 they pose as newlyweds in the shell of an abandoned car. As such, Dashti's practice represents an intersection of documentation, narrative and artistic expression in a region enduring continued conflict. The work is on show as part of She Who Tells a Story: Women Photographers from Iran and the Arab World at Cantor Arts Center, Stanford, California, USA (until 4 May 2015).